If it has been a while since you took the time to dig out that push broom and ladder, you are not alone. Property owners have a tendency to focus on maintenance issues that are in plain sight, forgetting about things higher up. The truth is that your roof needs just as much TLC as the rest of your property and our Gorillas are happy to take care of your Ladner roof cleaning needs! 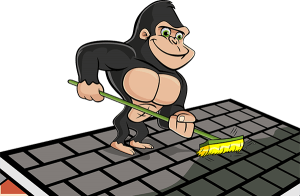 Ladner Roof Cleaning: Why Call The Gorillas? Ladner is home to a very eclectic population. Every Ladner resident has their own strengths and weaknesses and not everyone is keen to hop up on a roof! If you fall into this category, our Gorillas are here to help. Far from being afraid of heights, our Gorillas love them! Each and every Gorilla is trained in the art of safety and we have the tools to boot. You can rest assured that your property is getting the attention that it needs while you are safe on the ground. There are many ways to clear a roof of clutter but most of them can cause more harm than good. Moisture is retained in organic debris and can lead to moss growth and structural damage. The surface of your roof might seem hard and unyielding but in reality, it is more susceptible than you think. Our Gorillas know how to get your space clean without causing any damage. Moss might lend a rustic look to your property but it is not as pleasant as it appears. Moss spreads quickly, spreading onto and under places that you might not expect. Most homes and businesses have roofs made up of asphalt shingles. These shingles are great for protecting your home from weather but can do little to fight off moss. Once this plant has made its way underneath, it holds moisture against the surfaces of your roof. This causes rot and decay that can lead to holes in decking. When this material is worn away, it makes way for flooding, leaks and even the entry of rodents. Save yourself the grief and let us ditch that moss for you!